We invite you to explore India - the Land with infinite beauty ! Whether you soar high into Himalayas or peer under the ruins of the Ancient monuments dotting the landscape of India, you will cherish the experience long after your visit ! This India Travel Guide on Karnataka Tourism is free from any commercial interest! This site is dedicated to promote India - the vast subcontinent, its glorious past, magnificent landscape and its infinite variety. Bordered by Arabian Sea on the west, Andhra Pradesh on the east, Tamilnadu on the south and Maharashtra on the north, with Goa on the northwest and Kerala on the southwest, the State of Karnataka is topographically well connected. With the Western and Eastern Ghats, Deccan Plateau and the Sea Coast, Karnataka nurtures a blend of dales, hills, valleys and waters. The climate in Karnataka is largely salubrious year round. With three distinct seasons ranging from hot and dry - February to May, rain and sunshine - June to October and cool clime - November to January, Karnataka spells of tropical climate. The North and Northeast regions experience a much lower temperature during night time. A tropical rain forest climate with temperatures averaging 28 degrees C is seen in the southern areas. The city of Bangalore is the capital of Karnataka. The languages spoken here are Kannada, Tulu, Konkani, Kodava and Hindi. English is also widely spoken. Regions bordering near the neighboring states speak other languages like Tamil, Telugu and Malayalam. The popular religions in Karnataka are Hinduism, Islam, Christianity and Jainism. The state boasts of glorious monuments and towns, which stand testimony to the historical lineage. 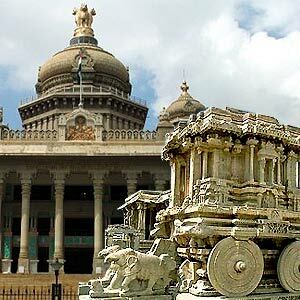 Karnataka also reveals a mixture of glorious culture and heritage, rich, diverse and ancient. The Karnataka of today is progressive, sophisticated and industrialized. World renowned educational institutions; talented human resource, unmatched variety and vibrancy characterize this knowledge capital of India. Connected with some of the leading airport cities in the world, there are national and international flights operating from Bangalore to various parts of the globe. Well networked by trains, Karnataka is connected by the Indian Railways to almost any/every part of the country. Some of the major stations in Karnataka are Bangalore, Mysore, Belgaum, Bellary, Mangalore, Tumkur, Harihar, Dharwad, Gulbarga and Bijapur. Ancient sculptured temples, scenic forests and beaches, popular eco-tourism locations of Western Ghats, cave temples of Badami, ruins of Vijayanagara Empire at Hampi, rock cut temples of Hoysalas are some of the prominent spots in Karnataka. India's tallest water falls - the Jog falls, the astonishing 'Kodagu' Coorg, and the thickly-forested hills located on the slopes of the Western Ghats - the coffee bowl of India, add immense charm to this State. Badami, the capital of the early Chalukyas, famous for its cave temples, the historical glory of the Hampi ruins, still upholding the grandeur of the Vijayanagara Kingdom can be seen. The monolith structures, statues and monuments exhibit the rich cultural heritage of this State. Hassan boasts of exquisitely crafted sculptures and architectural marvels, remnants of medieval era. The beautiful murals add magnificence to the era of Hoysalas who ruled between the 11th and 13th century. Mangalore port's old world charm with its palm fringed beaches and well manicured gardens, outstanding temples and salubrious climate add true value to the tourist's money. The district of Dandeli is charming amidst the backdrop of the Western Ghats. The wild life sanctuary here is a major tourist attraction. The natural beauty is inviting and a large number of hotels in the vicinity lure the tourists to this place. Think Karnataka and sandalwood crafts and carvings appear in our mind's eye. Mysore silks, metalware products, bidriare, lacquerware and more - there is enough for the avid shopper. The temple of Udipi is known for metalware with mythological figures cast in metal. And not to forget the exotic paintings like Kinnala which are famous with the locals, leaf work laid in unadulterated gold, and other delights. For those who are ready to splurge, Mysore paintings mesmerize with their bright vegetable dye colors and lustrous golden leaves. Expensive sandalwood carvings, finely wrought deities and decorative pieces also steal the show. Luxuriant Mysore silk sarees woven in traditional colours and real golden threads and brocade, these sarees enchant one and all.